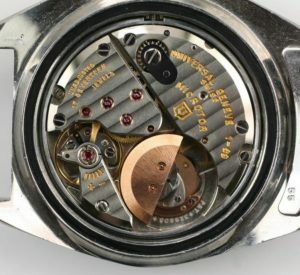 Watches weren’t always made as simple objects or to function solely as fashion accessories. Instead, most watches have roots in functionality first and foremost. That, at least, is the case with the Universal Geneve Polerouter Date. The Swiss designer Gérald Genta, who was born in 1931 and died in 2011, helped change the way watches looked with his bold designs. Through collaborations with various companies, Genta has had a hand in designing famed watches for Omega, Patek Philippe, Audemars Piguet and Cartier. 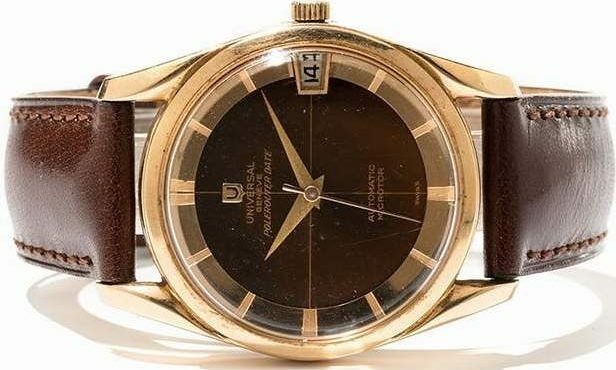 However, the Universal Geneve Polerouter Date is one of Genta’s most-famed. Designed in the 1950s, the mechanical watch came about as a way to mark the Scandinavian Airlines Systems’ polar flights from New York and Los Angeles directly to Europe. To take a shortcut and cut travel time, SAS would fly over the North Pole. That created difficulty, as the pole’s magnetic fields would interrupt the plane’s instruments. 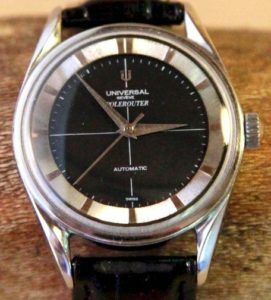 So, the then-23-year-old Genta was brought in by the airliner’s watch supplier, Universal Genève, to create such a wristwatch. The original Polerouter featured the SAS logo on the dial and was given to the flight crew after the airliner’s maiden voyage to LAX in Los Angeles. 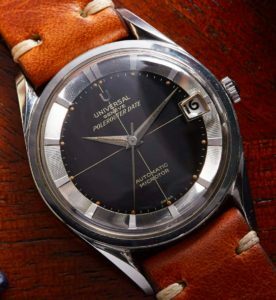 The name of the watch was originally Polarouter — which is fairly self-explanatory — but was renamed later the Polerouter. 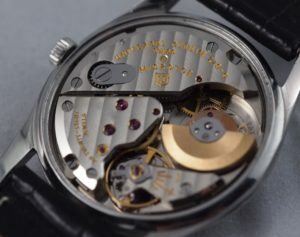 The watch was released to the public in 1954 and the first models were fitted with the 138SS automatic calibre, but was updated soon after to a calibre 215 Microtor, a new automatic movement with a very innovative micro-rotor winding system. What makes the Polerouter immune or resistant to the magnetic anomalies that interrupted the planes’ instruments? Did the watch use a novel movement — as in, was the 138SS developed for this watch by Genta? If not, is it simply the aesthetic of the case and dial that Genta designed? It’s a nice looking watch, for sure, but tell us more about it. He made some gorgeous watches!!!!!!!!!!!!! good article have you seen or repaired any of them? Another very interesting article. Thanks Mark! Good looking watch Do you have any for sale? Thanks for the history. Wish I could send you a pic of my Polerouter, which still runs great. A well designed watch! Was the Polerouter immune to the polar magnetic effects, and if so, how? Fascinating Mark. I had never heard of this watch before. Thanks!! Very interesting, I’m sure there’s a follow up article coming. Made me so curious I had to research to find out how it did it….. Good article Mark.